Vita Simone (left) and Carmen Anderson (center) on the truck. Those who have wondered about the fate of Art’s Crab Shack (4301 Broadway), the North Oakland mainstay that closed earlier this month, didn’t have to wait long for news of its replacement: Vita Simone and Carmen Anderson, the proprietors of Sassafras Seagrass (aka Sassy’s) — a quirky, now-defunct Oakland-based food truck — will open their first brick-and-mortar restaurant in the space sometime later this year. The restaurant will be called Copper Spoon, and it will specialize in some of the same type of food that Simone and Anderson served on the truck — what they describe as “family heirloom recipes” reinvented using Northern Californian ingredients. The first-time restaurateurs have both worked in the industry for years — Simone, in particular, is a well-known bartender and bar manager. (She has worked at, and developed cocktails for, such popular places as Bar Dogwood, Prizefighter, and Kingston 11.) 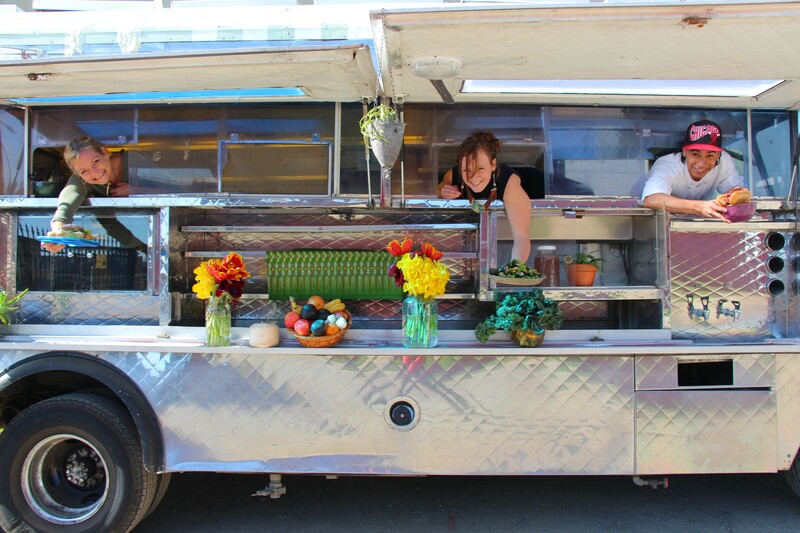 When Simone and Anderson launched Sassafras Seagrass in 2013, they were driven by the fact that not many other food trucks in the burgeoning Bay Area scene were serving “nutritional fast food” — instead, it was mostly fried foods that would leave diners feeling sluggish afterward. Their angle was to take family recipes — say, Simone’s Greek family’s tzatziki recipe or Anderson’s mother’s lamb merguez spice rub — and incorporate them into seasonal dishes that highlighted Bay Area ingredients. Anderson, who studied astrophysics in college, said her scientific background sparked an interest in studying fermentation, so the truck also served housemade sauerkraut and kombucha. According to Simone, the food truck business was a big success, but in February of 2014, the truck crashed on International Boulevard and was totaled — the result of a brake failure. Although Sassafras Seagrass lived on for a while afterward, the proprietors started looking seriously into the possibility of opening a restaurant. So when local real estate developer Ben Weinstein purchased Art’s after the restaurant’s second-generation owner retired and put the space on the market, Simone and Anderson jumped at the opportunity. They signed the lease last week. 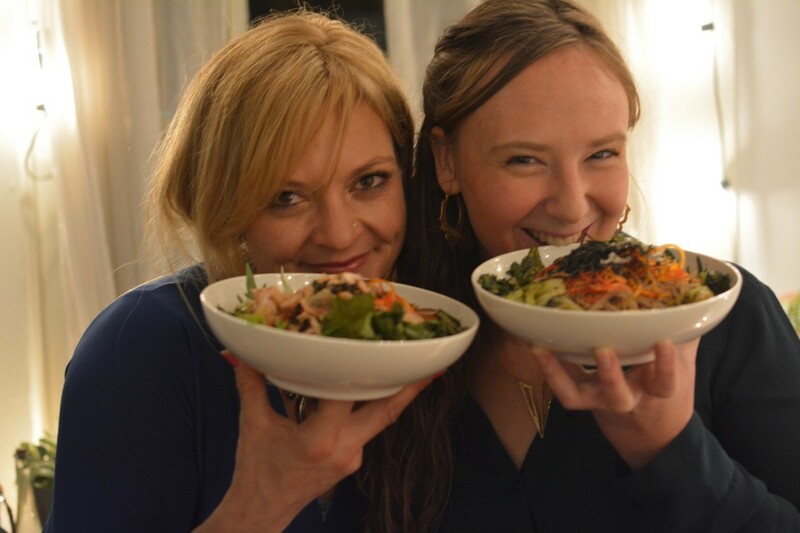 Simone (left) and Anderson show off their soba — a possible menu item. At Copper Spoon, Simone and Anderson will build on the approach to California cuisine that they featured on their truck, though they won’t be doing the actual cooking themselves. Instead, they’ve hired a chef who has a strong background in Japanese cuisine (they haven’t revealed his name yet, because he hasn't yet left his current job). In any case, diners can expect that Japanese flavors will have a prominent place in the “family heirloom” recipe mix; for instance, recent pop-up preview dinners included such dishes as salmon nori rolls (paired with a shiso cocktail) and soba served with pickled local night smelt. Overall, the menu will focus on small plates, seafood, and seasonal ingredients. Given Simone’s background, it’s not surprising that the bar will be a big focus for Copper Spoon, and Simone said she wanted to offer not just cocktails, but also well-crafted non-alcoholic libations. Of course, there aren’t many restaurants in Oakland with a bigger legacy than Art’s (open since the Sixties) and the soul food restaurant — and fellow North Oakland institution — Dorsey’s Locker (5817 Shattuck Ave.), which will also close at the end of the month. In particular, the two restaurants have served as hubs for Oakland’s African American community for generations. Simone and Anderson seem well aware of that history, and also of the way the departure of those businesses might be perceived: “North Oakland gentrification is officially complete,” one observer tweeted after the news first broke about the two restaurants closing. On its face, the food at Copper Spoon sounds like it could scarcely be any more different from Art’s, though the restaurant will serve crab in season. But Simone insisted that she doesn’t want the restaurant to cater only to what she called the “upper echelon tech boom,” and said that at least a portion of their menu will be affordable. The idea would to keep the Art’s legacy alive by having the restaurant continue to be, in Simone’s words, “a local watering hole where all of Oakland can meet.” Part of that will involve hiring a diverse staff, Simone said. Part of it will mean things like hiring longtime Oakland jazz musicians to perform at the restaurant. Indeed, Simone said the inspiration behind the restaurant’s name came from the idea that copper improves with age, becoming more beautiful as it develops a patina.